Facebook announced yesterday, through a post from Mark Zuckerberg, that significant changes on the social media platform are being implemented for 2018. While many of the practical details are unclear, the general message is that there will be algorithmic tweaks to the news feed which will favor meaningful interactions between individuals, and negatively impact posts and content shared through pages. What does this mean for businesses who share content, pay to promote posts, and advertise on Facebook? While the announcement was extensive, the details about what businesses can expect are still murky and largely undefined. 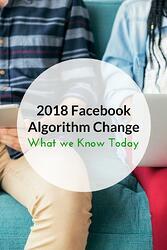 What Should You Expect from the 2018 Facebook Algorithm Change? We are continuing to research this new development and will update our clients on information as it becomes available. For now, we’d like to share what we know and our initial thoughts on how this could impact content and inbound marketing on Facebook. 1. Your business page posts will likely be seen by fewer people than before, and Facebook will put an even bigger value on engagement and thoughtful content. We have always believed that the best content to share is that which is both authentic and helpful. As a business, you have a product or service that is meant to add value for your clients. Sharing information your customers are searching for, valuable offers, or interesting insights will continue to be favored on Facebook. This implies that posts that spark interest, thoughtful comments, or even favorable reviews are more likely to stay in the news feed of your followers. Authentic and engaging content will be more valuable than ever. 2. Facebook has long been a pay-to-play platform. Paying to promote your content and have it seen by a large audience will likely still be an essential marketing tool. With this announcement, we expect a continuing evolution, with adjustments continuing to be made without a finite end in sight. As with all digital media, change is the only constant, so we will be keeping an eye on our analytics and reporting to see how these changes are playing out, and what best practices rise to the top. 3. The word is also still out on Facebook Ads. As a revenue generator for Facebook, we can only assume they will remain an essential element of their corporate function, so it’s clearly in their best interest not to diminish their effectiveness. As with boosted posts, we will keep a sharp eye on analytics in order to iterate effectively, so our clients get the best bang for the buck. We will report regularly on what themes, images, or other qualities are best-performing. 4. Fresh, original, targeted content has always been at the cornerstone of good marketing. We expect these solid elements to become even more critical as these changes take place. What does that mean in practical terms for your business marketing? Blogs that speak to your customers, and emails that are well-timed and relevant to your audience will take on more significance as social media continues to control the playing field. When you create valuable content on your own website, and connect with your customers through email marketing that is based on their specific needs and wants, you maintain control for how you market your own business and product. That will always be a valuable way to share your message. Since its inception, Facebook has gone through a myriad of changes and “game changers.” As a digital marketing agency we strive to learn, and then educate our clients on best practices that maximize marketing efforts and dollars. We will continue to find out more details and share them, along with our recommendations, as they become available.